Most companies need some time tracking method to record and verify how long each employee has worked daily, weekly or monthly on specific projects. This could be to make regular payments and also to monitor productivity and efficiency of workers. Timesheets come in various forms. 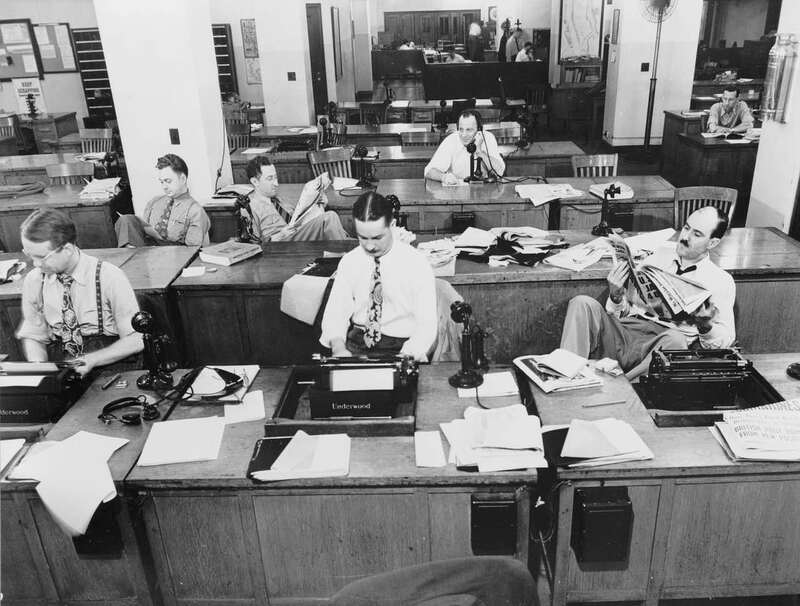 While, traditionally, a timesheet was a ‘sheet’ of paper where you manually wrote and calculated hours worked, it has now evolved into either an online shared document in excel or word format that everyone fills out each day, or an automated online software that runs in the background and tracks what your employees are working on. 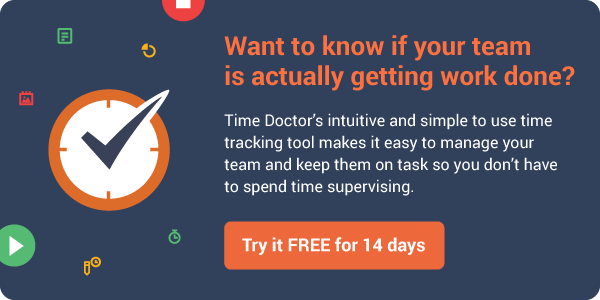 If you want to check out automated time tracking, rather than rely on preparing manual timesheets with Excel, I suggest you check out Time Doctor. Employee time tracking is used by large and small companies, agencies, remote teams, and growing startups, as it provides a quick and easy way to improve the productivity of your business operations. Timesheets are a way to log what employees were working on for every hour they’re in the office. This way you know what everyone is up to, and where people are spending their time. You can not only spot your most productive workers but can also analyze which projects or processes are wasting time and which are more profitable for your business. Once you have this knowledge, you can be a better manager and take insightful decisions for the growth of your business. Discuss Excel time tracking sheets which although manual and time-consuming, have certain benefits. 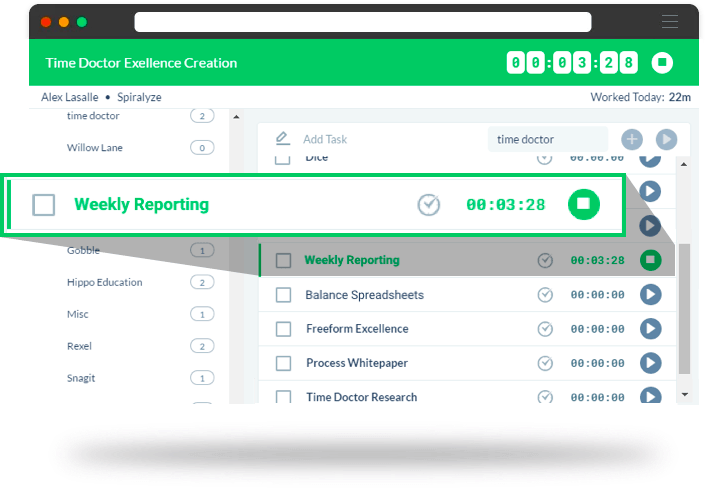 Finally, we will show you how to make time far easier, accurate, prevent timesheet fudging and make your team immensely more productive with Time Doctor – an automated time tracking tool. 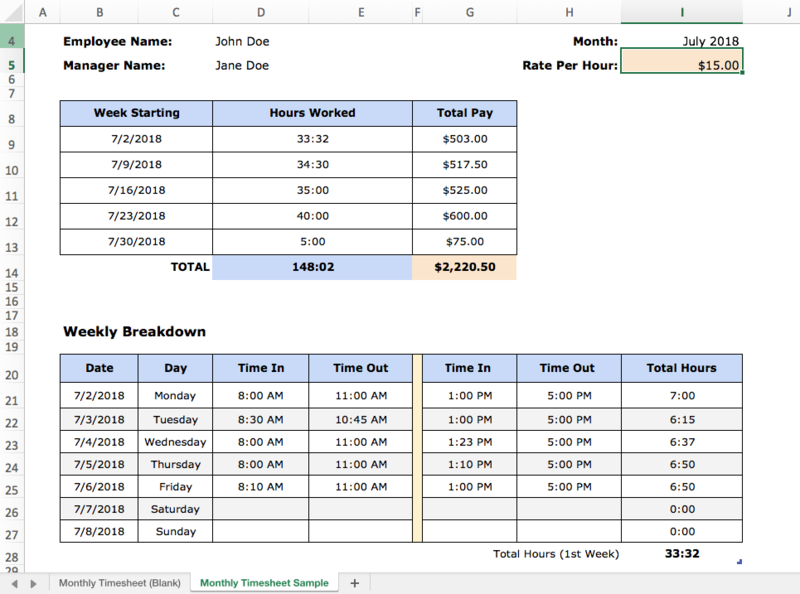 These timesheets are simple to use because employees only need to log-in the start and end time for work hours and the manager can use automated excel formulas to compute the total pay based on hourly rates and overtime pay. Moreover, many managers and workers in traditional, non-technical companies, are used to working with Excel rather than SaaS time tracking tools. A weekly timesheet is necessary if you calculate your employee work hours, paid-time-off and wages on a weekly basis. Some companies pay their employees once every two weeks. This bi-weekly timesheet can come in handy to compute your employee work hours, paid-time-off and wages for every 14 day period. Use this monthly timesheet if you calculate your employee work hours, paid-time-off and salaries once a month. Use this template if you work with different clients and need to calculate hours worked on specific projects. It can also be used in companies where billable hours need to be tracked to invoice customers correctly or where an employee’s time is tracked against projects. Download the appropriate excel time tracking sheet and modify or add any columns like employee location, employee number, job code or anything else that is necessary to record any specific aspect of your business. These excel sheets will handle all calculations for you based on formulas included within the spreadsheet cells. Total Hours are calculated automatically. You only need to enter your Time In and Time Out data. Total Pay is also calculated automatically based on the Rate Per Hour that you set. In our free excel templates, the cells containing formulas used to calculate total hours and total pay is locked. This is to prevent any accidental changes being made to them. If you create your timesheets from scratch, specify which cells the users can edit and lock the cells that contain payment calculations before you save your Excel sheet. You can also incorporate a Vacation/Sick Hours column. The employee can input this time, and it can reflect in the Total Pay depending on your company’s policy of paying for breaks due to illness, vacation, or time off. Quick Tip: Receiving and storing excel timesheets as printouts or as separate emails from each employee can be cumbersome. To make it streamlined, use Microsoft Sharepoint, to create a document library and enable incoming email. Your employees can then send their time sheets to a central email address. 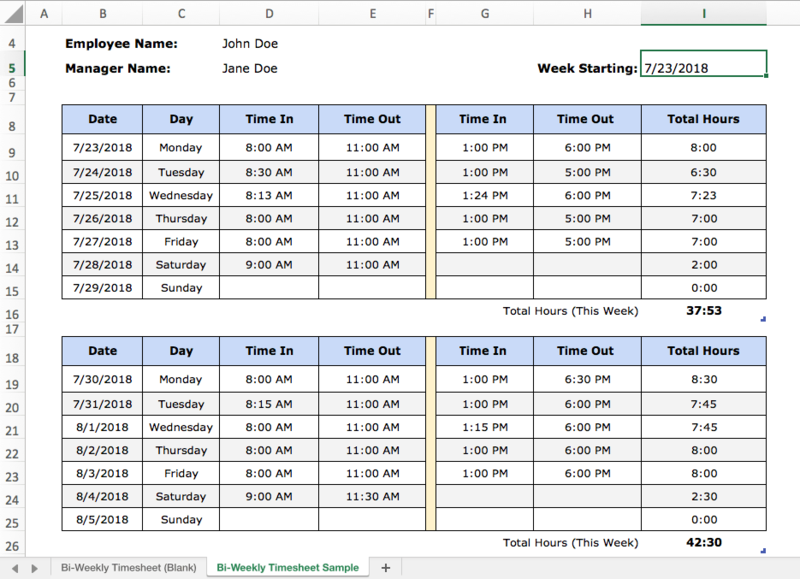 You can use these excel time tracking sheets to log and monitor employee hours, breaks, overtime, sick time, and vacation time or time away from the computer. You can also get an overview of how an employee is working – whether they have logged in more overtime hours or taken frequent vacations and sick days – by glancing at his timesheet. Although once more than a few months of data gets accumulated in Excel timesheets, it gets increasingly complicated to get an overview or analyze that data. 1. 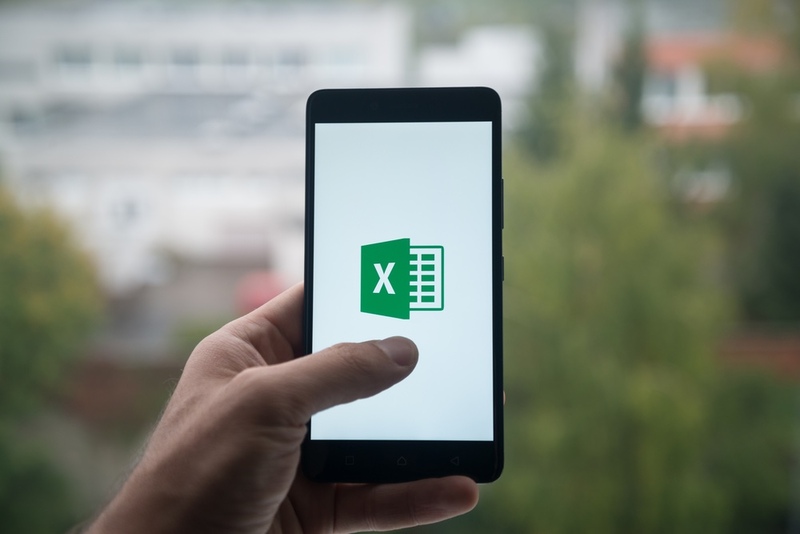 Excel is free as it comes bundled with Microsoft Office packages. 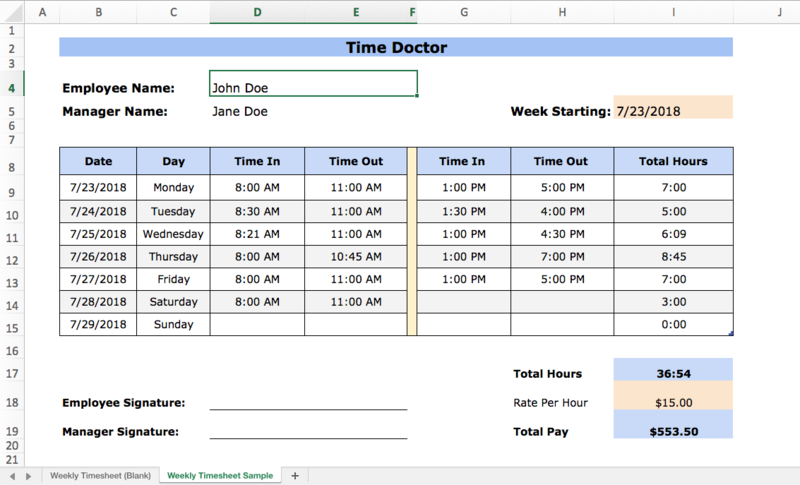 You can download our templates or create your timesheets on excel from scratch. You don’t have to pay an extra dime to buy any new software or app. 2. It is safe and straightforward to use. All employees need to do is log-in their in-time and out-time. They don’t have to worry about anything else. You as a manager also do not have to compute payments since excel formulas do that for you. It is certainly simpler than using a paper timesheet. Moreover, all data is saved locally on your corporate network drive. 3. No training needed. As a manager or employee, you do not need any additional training to start using Excel timesheets. But all is not rosy in the Excel world. 1. It is susceptible to human error. If formulas are incorrect, or sum calculations leave out key figures, or you forget to input data in the correct format, it could all lead to gross miscalculations and payroll errors. Moreover, the most common human error that is faced by excel sheets is mistakenly deleted timesheets. Often, it is challenging to recover data or entire timesheets deleted by accident. This could have disastrous results if there are no backups or systems to recover deleted data. 2. Cannot track actual work hours versus reported work hours. You have to depend on your employees’ ability to clock ‘in’ and ‘out’ times. When reporting time spent on a project, a discrepancy of 5-10 minutes may not be excessive, however, but if these variations are more significant, it can cost your business a lot of money. There is no way to monitor how long a worker is actually working on a task. 3. Difficult to modify or update data. Adding new data or making corrections to spreadsheets is time-consuming. Moreover, corrections may not even be seen until it’s too late for the pay period and the worker may get inadequate wages. 4. Analysis of a workers productivity is also cumbersome with excel timesheets. As a manager, you can look at a workers weekly timesheet to see how long he has worked on various days or specific projects. However, the volume of data presented in a single sheet can make it difficult to see patterns or make any useful insights. It can also lead to wrong interpretation of data and wrong decisions being taken based on those misinterpretations. 5. Historical data is not safe. Excel timesheets are not designed to store historical data. Very often, these files are “updated” to keep their size manageable, and in the process companies lose historical data. Without historical data, it is difficult to spot long-term trends or strategize how to build productivity systems for the company and its workers. 6. Not designed for ‘real time’ work. When you have a large team, it is very cumbersome to track which employees have submitted their timesheets. Often, the timesheet that is shared is not in real-time, so managers get delayed information on actual hours worked or inadequate information on changed circumstances. If an employee is on break for medical or emergency reasons, it may not reflect in the timesheet. Time tracking sheets are, at best, emailed once a week. This can pose the problem of the data getting lost in the managers inbox, duplication of data or even getting the wrong version of the file. 7. Excel tends to crash. The more you update and share a particular excel sheet, the higher the chance of the file getting corrupted and the data being lost. Using a cloud based-time tracking app can make it easier and effective to monitor employee work hours, not only for the manager but also for the employee. A good time tracking app will have multiple features to help you improve employee productivity, prevent misuse of company time for personal reasons, help in workforce planning and allocation, track project progress, manage client billing and so on. Moreover, they are stored in a single database which makes it easier to generate reports for individuals, small groups of employees, departments or the entire company. Another benefit is the ease of identifying when changes were made to time sheets and by which users. Also, corrections made on time tracking apps are instant which means fewer payroll errors. Time Doctor is an automated, cloud-based time tracking app used by companies running remote teams, digital agencies, and more. The tool monitors work hours in real-time and right down to the second, so they don’t have to remember if they spent 5.30 hours on the APPLE project yesterday or 5.39 hours. 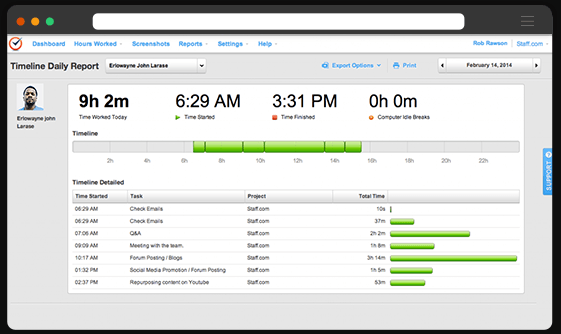 You can track time spent by each employee on specific tasks and projects. The app not only tracks the total time worked by every member on your team but also provides a breakdown on how much time is spent which projects (or clients) and tasks. However, the tool does not monitor employees’ activity during their free time or after office hours. Total time worked on each task can be manually modified, and the manager can see whether any manual addition or deletion has been done. You can use Time Doctor on a desktop as well as mobile. Detailed reports are available on your web-based account. Once you have finished working, it can get difficult to remember accurately how much time you spent on which tasks. Moreover, if you don’t fill your manual timesheets regularly, it can lead to an inaccurate accounting of start and end times. When using Time Doctor, you don’t need to remember anything, because time is tracked automatically as you’re working. Time Doctor automatically generates timesheets, and no manual data entry is required. The tool reminds you to start tracking time and also to stop tracking time when employees visit websites that may not be work-related (like Facebook). The moment you leave your computer, Time Doctor automatically stops tracking time. Often, when manually tracking time employees forget to count the numerous coffee breaks and bathroom visits causing inaccurate tracking of work hours. The moment there is no keyboard or mouse activity for a while, Time Doctor stops tracking. It also gives users the option to show afterward whether or not they were working during that time. The tool utilizes various methods to confirm if the time tracked was real work. These include screenshots taken at regular intervals, levels of keyboard and mouse activity, and which websites or applications are used. You also can’t “double book” your time. For instance, if you allocate time for activity A to 3-5pm, you can’t assign a second activity to that same time slot. Time Doctor keeps track of all the applications and websites employees visit during work hours. Managers and individuals receive a weekly report outlining which websites and applications were used, and for how long. This report helps identify productivity issues. For example, if you’re a content writer and you’re only spending 20% of your time on writing, you can see what’s occupying the rest of your time and make adjustments to get back on track. This is also an extremely useful feature if you work with remote employees or freelancers. This feature can help ensure that they are actually working and not doing personal work on company time. If you use excel for time tracking, this would have been impossible to verify. The tool allows you to take screenshots of employees’ screens but only if you choose to enable this feature and with employees’ consent. Employees can also delete screenshots if they were accidentally running Time Doctor when doing personal tasks like commenting on Facebook. Time tracking with screenshots is useful for monitoring remote employees, and for some types of companies such as design shops which can use them to review work processes and improve productivity. You can use Time Doctor to make payments to your employees and freelancers directly by integrating it with PayPal, Payoneer, TransferWise and several other payment apps. Payments can be made based on hours worked. 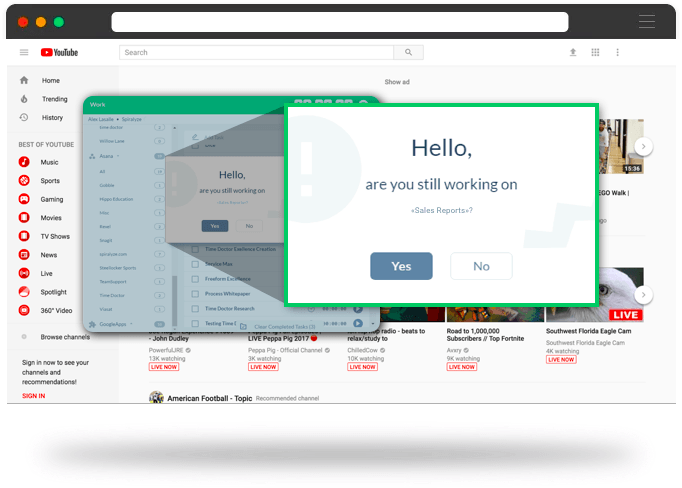 If you open a social media or any entertainment site while working on a task, Time Doctor will generate a pop-up to ask you if you are still on your current task. It’s a great way to avoid getting distracted. The tool also sends a weekly poor time use report to team managers with a list of distracting websites and applications viewed and the duration they were used, during work hours. Time Doctor has the capability of creating several types of reports such as Timesheets, Time Spent on Each Project/ Task and several others. These reports can be customized for different parameters – for a particular employee, a group of employees, a particular project, date ranges, etc. You can use this information to analyze which project or clients are more profitable and where you may be losing money. If you are a solopreneur, have a really small team or only just starting out tracking employee time, it may be simple and effective to go with our free excel time tracking sheets. However, once your business grows, and you are ready to spend on a really cool and efficient time tracking tool that is completely automated and takes the entire burden of tracking employee work hours out of your hands, give Time Doctor a shot.